Purchasing a ticket, or more, to the 2019 Taste of Williamson event is the gift to yourself that will keep on giving. It is also a gift to Begin Anew to impact the lives of adult learners working hard on their second start in life. This year’s Taste of Williamson event will be held on Sunday, March 3 at the Cool Springs Galleria from 7:00 – 9:00 p.m. Almost 40 restaurants and caterers have signed up to date to be a part of this exciting event. Attendees will be able to receive two drinks, sample food, meet chefs and enjoy musical entertainment as they stroll throughout the Galleria. Ticket purchasers will also receive even more! If you go out to enjoy any of these participating restaurants during restaurant week (March 4-8) and bring your ticket stub, you will receive 10% off (excluding alcohol, taxes and gratuity). And it doesn’t stop there! Participating caterers at the Taste of Williamson event will give 10% off box lunches ordered during restaurant week and used within 30 days. Some exclusions apply, but what a deal!!! TICKETS ARE $35 IN ADVANCE AND $40 AT THE DOOR. BUY NOW! And the deal doesn’t even stop there. By far the biggest gift you will receive goes beyond excellent food, favorite beverages and a relaxing evening out. It goes beyond additional savings at restaurant week. The biggest deal is investing in the lives of the students at Begin Anew. Students who are engaging in English as a second language skills while receiving a second chance. Who have gathered the courage to prepare for their HiSET(GED) but receive a huge lift in confidence. Who study for job/computer skills and become a part of a larger community. Who develop a deeper relationship with Jesus Christ or learn about him for the first time. You would help students just like Mario. He began the work needed to receive his HiSET from Begin Anew. During the course of his studies and upon graduation, Mario went from part-time employee to full-time employee to manager to college student. Both of his sisters are now studying for their HiSET at Begin Anew. These siblings are breaking the ranks of the socio-economically disadvantaged because of your support. Purchase a ticket to Taste of Williamson by calling Begin Anew at 615-244-3669 or emailing elaine@beginanew.org. Tickets can also be picked up at our office at 420 Main Street, Nashville, TN 37206. Eat well and invest in lives today. Begin Anew held Winter Graduation in a new location this December with a record number of 39 graduates! Eastland Baptist opened their church to welcome Begin Anew staff, volunteers, graduates and their families to celebrate their educational successes on Saturday, December 8th, 2018. The church looked grand and beautiful with holiday lights draped throughout the impressive 98 year old sanctuary. It was a perfect setting for a celebration. Graduates arrived excited about the day; as they dressed in the black graduation gowns with the caps and tassels, they saw themselves in a new and exciting ways. As they stepped forward to receive their diploma/certification, a sense of accomplishment and pride radiated on every face. Each student represented a journey, a story, and a life blessed by Begin Anew. They accomplished what they set out to do, a dream had been realized for them, new doors and opportunities were opening up for them. Family members, friends, tutors, teachers, encouragers, prayer partners, and Begin Anew staff all rejoiced with each student, recognizing the hard work and determination demonstrated to make this day a reality. In that trust, we all rejoice, knowing that Christ provides for each of us a life of celebration and having dreams come true. By placing our trust in Christ, we can all Begin Anew! A lot can happen as students get involved in the process of achieving their high school equivalency through Begin Anew. They become part of the classroom community and many make new friends who are working on similar goals. Students begin to grow in knowledge and in academic skills, but they also begin to grow in confidence. Something that had seemed, for many, an impossible task begins to become something that they see themselves achieving. Tyrone Lawrence exemplifies this growth and change that can take place. He has been in the program for almost nine months and has already passed one of the official HiSet exams. Tyrone actively participates in the Bible study time. He willingly shares his own insights and makes contributions that are helpful for the other students, many of whom do not have any personal faith. He can often be found in the parking lot after class visiting with new friends who are in the program. In recent months,Tyrone has been diligently working on math. His grasp of the material has grown as well as his confidence. 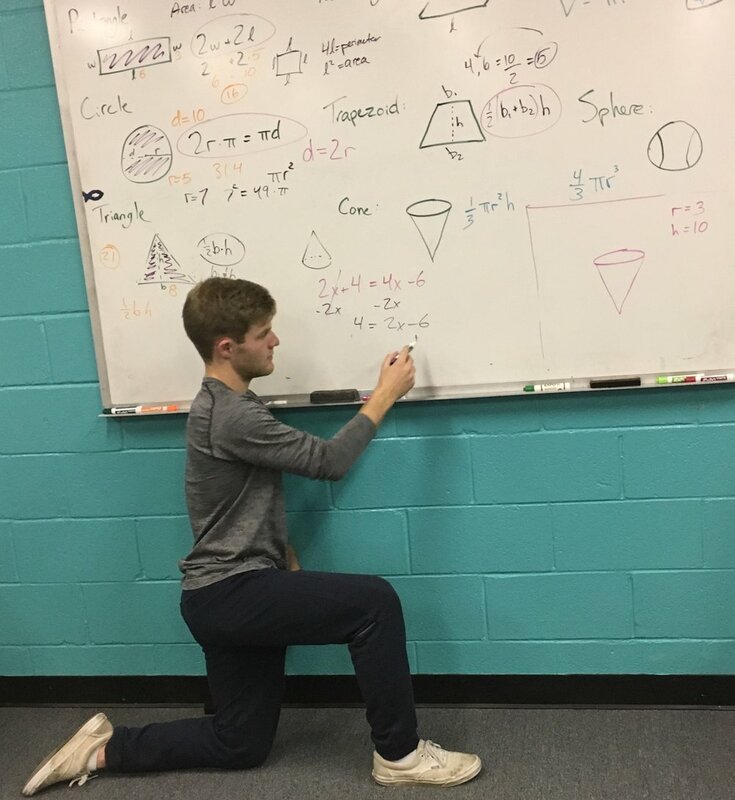 He is pictured above giving instructions to his tutor, who is at the whiteboard, about how to do a math problem. Just a few months ago that would never have been possible. Tyrone entered the program with a goal of having his own line of clothing developed to sell. He has already moved ahead with this project and has some items for sale. He has other goals that require him to finish what he has started at Begin Anew, obtaining his high school diploma. With determination, dedication, and hard work, he can do it! Begin Anew is blessed to be able to be a part of changing the lives of many people. If you would like to be involved, you can find our contact information on this site. In just a few days, on December 8th, Begin Anew will celebrate our graduates! It is a very exciting time as we pause to think about how far our students have come and pray for them as they consider where they will go from here on their journey forward. While this celebration is an unchanging tradition for us, at least one thing will be different. We will be in a new location this time. Eastland Baptist Church at 1215 Gallatin Ave. in Nashville will be providing their space for our event, and we would like to express our deep gratitude to this church and to Pastor Jason Rumbaugh for his gracious hospitality toward Begin Anew. If you would like to visit, they offer Sunday School classes at 9:30 AM, and they have a café that serves coffee and doughnuts from 10:30 -10:50 am. Sunday morning service begins at 10:50 am. God seems to be very busy at work in our midst, calling on us all to learn new things, meet new people, rise to new challenges, and go to new places. It can feel unsettling for us sometimes as we are thrust into change, but one thing we can be sure will always be the same… “The steadfast love of the Lord never ceases; his mercies never come to an end; they are new every morning; and great is His faithfulness.” Lamentations 3:22-23. Mario Lee was a hard-working man raising a family when he made the decision to begin something new. It had been about ten years since Mario had been a student when he decided to go back to school to earn his High School Equivalency diploma. He enrolled at the Madison Men’s site of Begin Anew in November, 2016 and it was obvious from the first day that he was ready for the challenge. He jumped in and began studying the subject that many find very intimidating – math. He was dedicated to attending class and made good use of his time and resources. Mario studied with numerous tutors, learning from them what he knew he needed to succeed. Mario embraced the whole experience of Begin Anew. He always came to class with a positive attitude and was an encouraging force to others in the program. He was ready for the community in the classroom and was an important part of the “brotherhood” that has developed at the Madison Men’s site. The spiritual component of Begin Anew includes a weekly Bible for the students. Mario entered this time with enthusiasm and a desire to grow and learn. He spoke of the meaningful experience Bible study was for him and it was clear that he wanted to grow in his understanding and experience with God and Christ, our Savior. Mario studied hard and passed all of the HiSET exams, graduating from Begin Anew on June 2, 2018. He has enrolled at Nashville State Community College and is moving ahead to new opportunities and challenges in his work with Nashville Parks and Recreation. Mario’s life has been positively impacted by his experience at Begin Anew. He has finished strong and is now beginning anew with his future endeavors. Godspeed, Mario! You have made us proud. Time to Celebrate Our Volunteers!! This week, Begin Anew of Middle TN celebrated some of our incredible volunteers at the Mary Catherine Strobel Award Luncheon! The room was filled with people who work and volunteer at local non-profits throughout Nashville. Truly, the room seemed to pulse with the energy of a people who truly care for this city. What an inspiring place to be! Linda Jones and Danni Hughes represented the group from Covenant Baptist Church. This amazing group has been serving meals about once a month to our Nashville site students for 3 years. This church provides Christmas presents for the students and snacks and juice boxes for the childcare program. Several of the ladies from Covenant Baptist are also serving as prayer partners or tutors on a weekly basis. We are absolutely blessed by them! 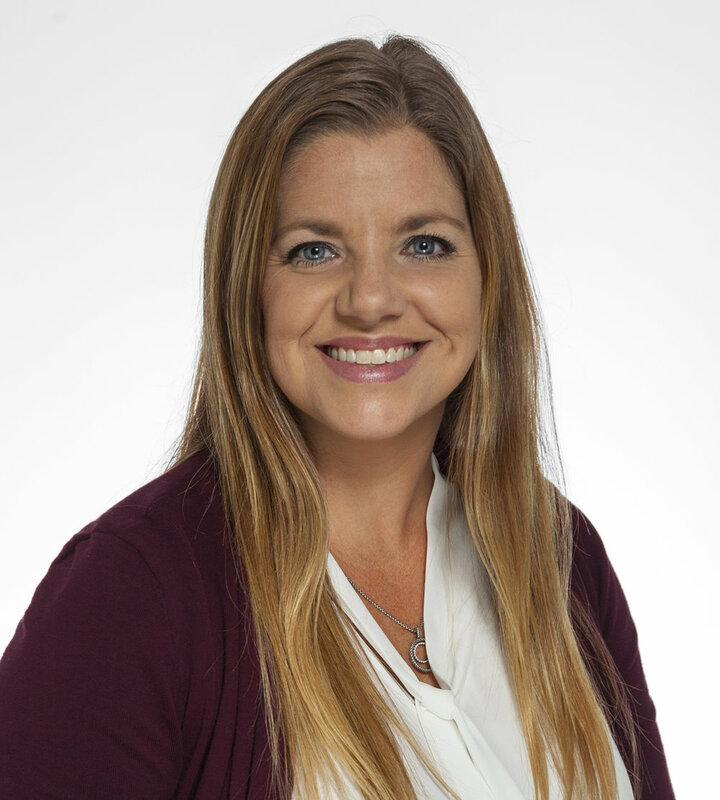 Another one of our amazing volunteers, Casey Enright, is the founder and director of The Word Wagon. The Word Wagon is a literacy organization dedicated to promoting childhood literacy by providing reading opportunities and reading materials for children who lack access to books. Casey brings The Word Wagon to our Begin Anew childcare program once a month and the kids love it! The kids jump for joy knowing that she is coming! She reads stories to groups and one-on-one with the students. Every time she comes, she sends each child home with a bundle of books. It was such a joy to celebrate some of the most selfless, compassionate, and loyal volunteers we are blessed to have on our team at the Mary Catherine Strobel Award Luncheon! 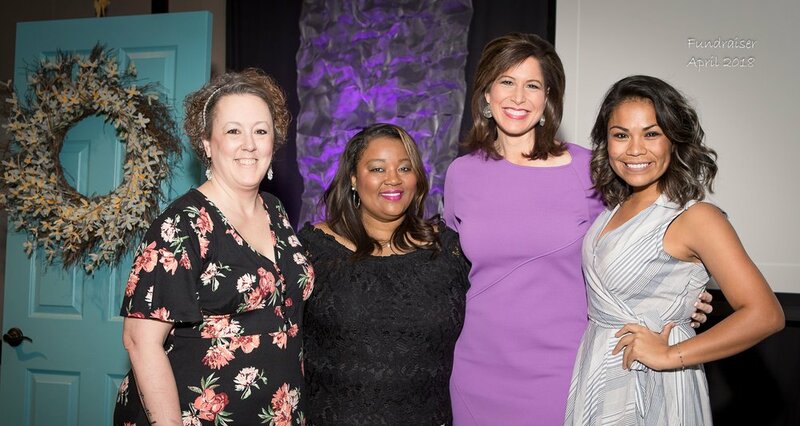 2018 Spring Fundraiser: "Unlocking Potential"
These current and former students from Begin Anew, pictured with Channel 4 News anchor, Holly Thompson, have discovered the keys to unlocking their potential. Unlocking Potential was the theme of Begin Anew’s fundraising event on April 12th. It was a time to celebrate and challenge all current and future students, volunteers and donors in how God, through Begin Anew, can unlock our potential and find a future and a hope. Helping to unlock the evening was “Channel 4 News Today” co-anchor Holly Thompson in her 14th year to emcee the event. Honorary Chair, Mary Frances Turner, spoke to the 400 guests that evening about how her relationship with God and reliance on His promises helped her discover and unlock her potential in ways she never could have imagined. Vocal trio Carrie Greening, Carrie King and Stephanie Moore beautifully sang traditional hymns, providing inspiration and reflection. Video and live student testimonies gave evidence of how Begin Anew has opened doors. 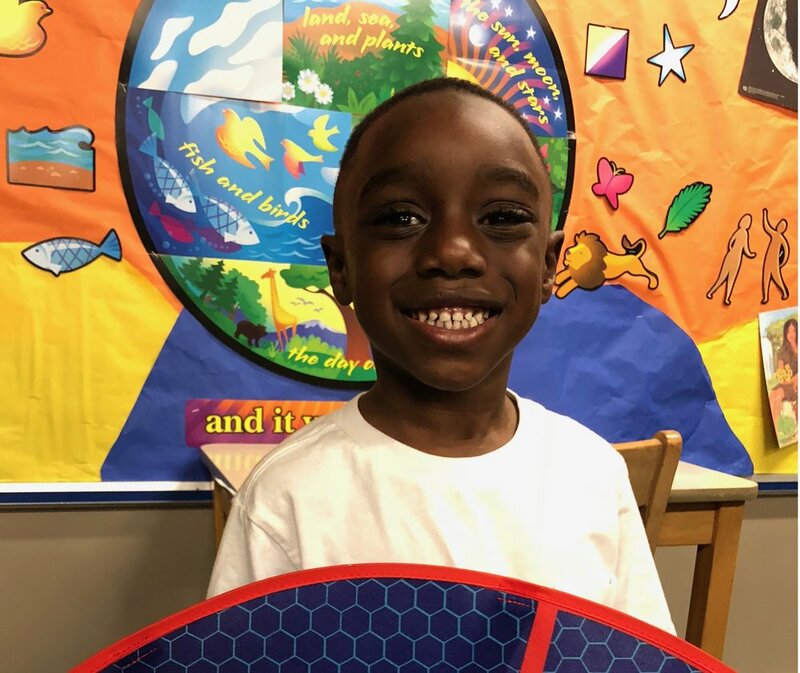 Beautiful, smiling faces of Begin Anew students adorned the screen as they described how they were able to unlock their potential and find hope and a future. Mario, a graduate from the Madison Men’s program shared: “I got involved in gangs, been through a lot of failures. To succeed at Begin Anew . . . I have a lot of doors opened for me now, especially since I graduated: I’m on my way to college, I’m married, looking to buy a home. Thank you to our amazing Fundraising Committee! And thank you to everyone actively serving, financially supporting and faithfully praying for Begin Anew! Your support continues to unlock doors and provide students the keys they need to be successful. In February, my ESL Level 2 class studied the story of God’s people being taken into captivity by the Babylonians. The story resonated deeply with the students. All of them are refugees or immigrants. They have experienced many challenges in making the United States their new home. They too have lost family members due to conflict in their home countries or have left behind loved ones who are still in perilous situations. The advice God gave to the Israelite people to build houses, settle down, plant gardens, be good citizens, pray for the people of the city where you have been sent is just as applicable to them. As I told the story that night, I was reminded of the power and the relevancy of God’s Word. Each week at the Woodbine site, we tell Bible stories to our students. Students from around the world with different religious backgrounds are united as we come together for Bible study. Some have never heard the stories we are telling. This particular story ended with words of encouragement for them and for us. Have you noticed that when you see someone smile, you are likely to smile back? 1. I saw joy when a student learned she had finally passed her Hi-SET Math exam after attempting to pass it for the past 4 years. 2. I saw joy when a student learned a group of individuals had paid her monthly rent. The student works at a fast-food restaurant and had missed several days of work to stay home with her sick children. 3. I saw joy when a student and her Begin Anew Encourager saw each other on the first night of class after being out for Christmas break. 4. I saw joy when a potential student learned that Begin Anew offered free childcare. She dropped out of her GED classes 2 years ago because she had a baby and could not find childcare. 5. I saw joy when a student shared that she and her children had recently gone to church for the first time in several years. 6. I saw joy when a student shared that her Begin Anew Prayer Partner had met with her to talk and to spend time together. 7. I saw joy when a student and her tutor celebrated that she passed her driver’s test after they had studied for the test together. Many of our students’ lives are filled with stress, anxiety, and uncertainty. But at Begin Anew, they receive love, support, and encouragement. I am thankful to be part of an organization that seeks to improve the social and emotional health of our students. I can’t wait to see where I will see smiles next! Begin Anew Graduation December 2017! 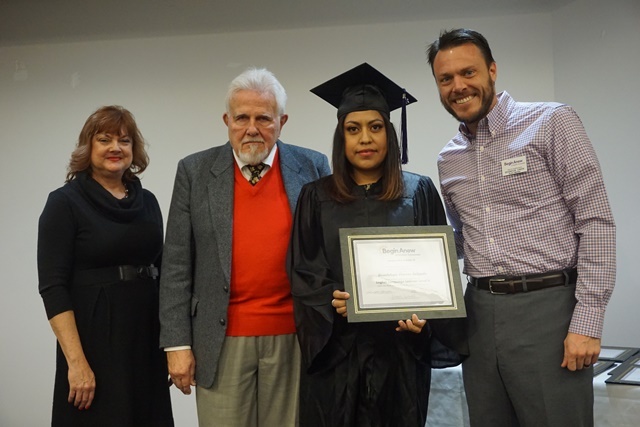 If you missed the Begin Anew Winter Graduation on December 9th, you missed an exciting celebration! The room was full to capacity as family members, friends, and supporters of the 36 graduates cheered, rejoiced and even shed a tear or two celebrating the accomplishments of those walking across the stage to accept that long anticipated certificate of diploma. This was the largest graduating class for Begin Anew. What a wonderful achievement to have so many graduates in the 20th anniversary year. It only speaks to what lies ahead for Begin Anew. As the ceremony progressed, each Program Director reflected on the successes they had seen in their students. Their encouraging testimonies highlighted the hard work done not just by the students but also the teachers, tutors, encouragers, prayer partners and bible study leaders who provide such a united wave of support to help the students make positive changes in their lives. Also in the room were many board members and financial supporters who, without their continued support and commitment, Begin Anew could not be the organization that it is. Each student that spoke during the ceremony shared their personal journey; you could see the impact they felt by being in the Begin Anew program. Needless to say there was much love in the room as we celebrated with the graduates, especially during this special time of the year, the holiday season. What an incredible organization that never loses site of our ultimate purpose which is to draw others closer to Jesus Christ. No better gift to give to another, than the chance to Begin Anew. Word. Excel. Outlook. Knowledge of these computer programs is essential in today’s workplace. Women in the Begin Anew Computer and Job Skills track learn these programs and more. They learn job skills such as resume writing, interviewing, job-searching, and networking as well as life skills like managing finances, setting goals, and making decisions. In addition, the students participate in mentoring and a weekly Bible study offered on site. Our holistic program offers students the opportunity to grow socially, emotionally, spiritually, and economically. These dedicated students attend classes for nine months and must complete all the required coursework to graduate from our Computer and Job Skills program. Many of our graduates go on to find meaningful employment, enjoy increased satisfaction in their work, obtain a promotion, or receive an increase in wages because of their newly-acquired skills. Computer and Job Skills is just one of Begin Anew’s many programs designed to empower individuals to overcome the obstacles caused by poverty. Do you know someone who would benefit from enrolling at Begin Anew? How about someone who wants to volunteer as a computer teacher? We are always excited to welcome new students and volunteers to make a forever difference in our program. On September 26, we kicked off a new program at our South Nashville location in partnership with WorldCrafts. Begin Anew had five new adult students gather at Christ Church to attend English classes and also become employed artisans. Each Tuesday and Thursday morning students arrive ready and are excited about their new job. Yes, they earn money all while having fun and learning English. What does a typical morning look like for these artisans and learners? From 9:00 am to 11:00 am, they are making purses, banners and assembling keychains; from 11:00 am to 12:00 pm, they attend free ESL classes with free childcare provided. In addition, I am happy to say I have the most amazing volunteers. They arrive each week filled with excitement and joy. I am truly grateful for every hour they are with us. They are jewels in my crown. Many thanks to each of you! I am also excited about our new ESL classes at Tusculum Hills Baptist Church and Christ Church. We started our first ESL class at Tusculum Hills with seventeen students in attendance! We will begin our first ESL class at Christ Church on Monday, October 16. We are expecting this day to be as exciting and productive as the one at Tusculum Hills. We have a specific need for ESL Teachers on Wednesdays from 6 to 8 pm at the Tusculum Hills Baptist Church location. Also, if you want to support the refugees to make additional items, (thus providing them additional income), $10.00 provides the materials and labor for one screen printed item; $8.00 provides the materials and labor for one keychain. Keep us in your prayers and consider being a part of this ministry as we embark on a new journey!